Background & Objective: Cellular physiology and energy metabolism are maintained by the constant supply of energy furnished by the powerhouses of the cell called mitochondria. Cellular homeostasis depends on the timely clearance of damaged cellular organelles and proteins via pathways including autophagy. Mitochondria and mitochondrial autophagy play a vital role in cellular health and failure of these pathways can have a devastating effect on cellular homeostasis. Amongst the various cell types, neuronal cells are more vulnerable to bioenergetic depletion since most of their functions critically depend on the availability of energy derived from mitochondrial metabolism, thus making neurodegenerative disorders an obstinate issue. Research in the past few decades has shown that these neurodegenerative disorders are associated with mitochondrial dysfunction and compromised mitophagy leading to accumulation of protein aggregates which ultimately culminate in neurodegeneration. Conclusion: Thus, targeting mitochondria and autophagy-related proteins and enzymes in neurodegenerative disorders may open the avenues for potential targets for discovering effective therapies. 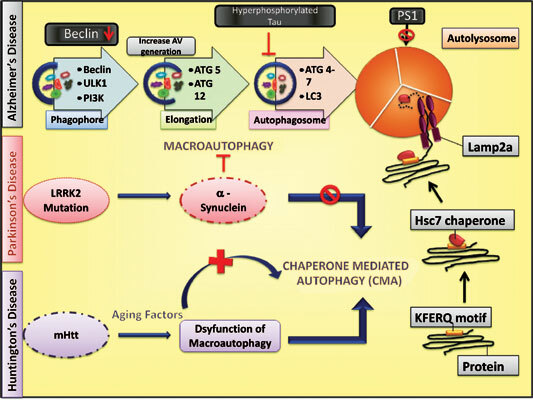 Here, we review the involvement of mitochondrial and autophagy dysfunction in neurodegenerative disorders specifically focusing on Alzheimer’s, Parkinson’s and Huntington’s disease. Keywords: Autophagy, mitochondrial dysfunction, mitophagy, Alzheimer's disease, Parkinson's disease, Huntington's disease. Keywords:Autophagy, mitochondrial dysfunction, mitophagy, Alzheimer's disease, Parkinson's disease, Huntington's disease. Abstract:Background & Objective: Cellular physiology and energy metabolism are maintained by the constant supply of energy furnished by the powerhouses of the cell called mitochondria. Cellular homeostasis depends on the timely clearance of damaged cellular organelles and proteins via pathways including autophagy. Mitochondria and mitochondrial autophagy play a vital role in cellular health and failure of these pathways can have a devastating effect on cellular homeostasis. Amongst the various cell types, neuronal cells are more vulnerable to bioenergetic depletion since most of their functions critically depend on the availability of energy derived from mitochondrial metabolism, thus making neurodegenerative disorders an obstinate issue. Research in the past few decades has shown that these neurodegenerative disorders are associated with mitochondrial dysfunction and compromised mitophagy leading to accumulation of protein aggregates which ultimately culminate in neurodegeneration.